As Facebook CEO Mark Zuckerberg demonstrated over the last several days with his congressional testimonial, Facebook continues to dominate headlines with threats they are facing as an organization. Two of these threats are getting almost all the coverage, but I would argue a third issue is far more serious – the growing defection of marketers and advertisers with large hundred million dollar accounts exiting their platform, which is largely unrelated to their current troubles. Since Facebook wasn’t actually built as an ad platform (it was built to be a community) – that’s not totally surprising. First, as everyone knows, the recent Cambridge Analytica scandal is causing enormous headwinds for Facebook. It is calling into question the company, its purpose, how it is run and operated, and what implications its service is having on global civil society. Over the last several weeks, regulators and lawmakers across the US and the EU have been looking into a variety of ways to tighten their grips on big tech companies who hold lots of consumer data – and Facebook is in the bullseye. We should expect that scrutiny to get only more intense. The criticism is being amplified by tech peers including: Apple’s Tim Cook, Alphabet/Google, and even former Facebook executives. This represents a significant break by the tech community to criticize one of their own – whatever their motives. The second problem of much lesser concern is the small but vocal movement around getting rid of Facebook – the so called #DeleteFacebook movement. This campaign, which doesn’t appear to be picking up enough steam to truly cause the company problems, is being egged along by the likes of Tesla/Space X’s Elon Musk, Cher, and Will Ferrell, among others. Expect this to be short lived. There just isn’t a viable alternative and many users find Facebook frankly addictive. While the regulatory threat is far more significant to Facebook than the #DeleteFacebook movement, the real threat is to the company’s advertising-supported model. Facebook – like Google – is a free service for consumers financed and subsidized by advertisers – just like broadcast TV is. 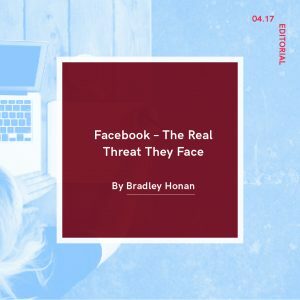 A defection in the ranks of advertisers is the real threat to Facebook – far more serious than significant new rules, laws, and regulations. As reported by The Wall Street Journal recently, there is a growing “unease” among the people who pay the bills and especially the large advertisers (think P&G) who spend literally hundreds and hundreds of millions of dollars a year marketing their brands. And these concerns aren’t anything new. Recall just last fall when Facebook significantly restated the number of users on its platforms that they pitched advertisers they could reach for them. Facebook is hanging strong with smaller advertisers, but it’s the major ones who truly set the direction for the industry. 1) Objectionable Content. Programmatic advertising is fast and inexpensive to place because it’s machine driven and therein lies the challenge. Advertisers are very concerned about having their ads appear next to content they and their customers consider objectionable. Facebook and Google have responded with an analog solution – hire people to police where an advertiser’s content goes and have human beings determine what is and isn’t appropriate. This is so significant a concern that even in a digital age, many marketers prefer the certainty of TV advertising where they can explicitly understand what content (read: shows) their advertising will run on, rather than “risk” social/digital advertising next to objectionable content. Nevertheless, for both Facebook and Google, this is a significant, but likely a manageable issue. P&G this month said it cut more than $200 million in digital ad spending in 2017, including 20% to 50% cuts at “several big digital players,” partly because better data showed it was wasting money. P&G found that the average view time for a mobile ad appearing in the news feed on platforms such as Facebook is only 1.7 seconds. Restaurant chain Subway plans to cut back on Facebook spending this year because of concerns about whether its ads are being viewed sufficiently, according to a person familiar with the matter. One global beverage company is planning to cut its spending on Facebook ads by about 30% in the U.S. and the U.K. this year because of a decline in effectiveness, according to a person familiar with the matter. One interesting statistic to keep in mind is that the average social media user scrolls through so much content each day on their mobile feed that, if measured in length, it would be about the height of the Statue of Liberty. The Facebook platform offers incredible targeting capabilities, but the clutter is simply overwhelming – and it’s a significant struggle to break through. So Zuckerberg and Co. for sure need to clean up who has access to what consumer data – but they also need to figure out how to make their platform more useful to the marketers and advertisers who are paying the bills. Since Facebook was built as a community, not an ad serving platform, how their advertising engages consumers’ needs to be rethought. Chances are Facebook will be able to do both, but it remains to be seen how this will play out. Stay tuned! Bradley Honan is the CEO of KRC Research, an opinion research and data analytics company. Ready to Take Your PR Training to the Next Level? You Need These 3 Skills. Get the latest updates from the PRSA Tri-State District! Follow Us @PRSATriState on Social Media!